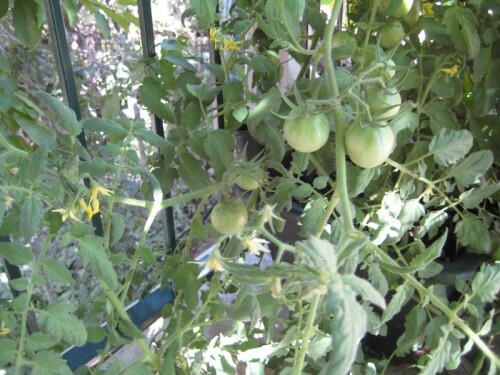 I have no idea how it happened, but one of my tomato vines is growing yellow tomatoes. Interestingly, they taste every bit as sweet as red ones; but they are probably not very high in the carotenoid lycopene, which presents as a red color. My tomatoes (see their portraits below) are not perfect like the ones from the grocery store; but … Oh my goodness, the taste is quite wonderful. Lewis Grizzard, a writer, and stand-up comedian said; “It’s difficult to think anything but pleasant thoughts while eating a homegrown tomato.” I must agree. I don’t know what exactly is involved in the ripening process of tomatoes; but what I do know is that somewhere between picking a green tomato and ‘gassing’ it to encourage its ripening, something really important must be happening to the one ripening on the vine. This is, of course, judging solely by the taste difference. Not to belabor the subject of nutritionism, but the fact is that scientist discovered that ONE of the phytonutrients in tomatoes, lycopene, is an active antioxidant. Lycopene is one of the hundreds of carotenoids. So what do you know? The tomato growers are now raising and marketing “high-lycopene” tomatoes. A review of 72 different studies showed that the more tomatoes and tomato products that people eat, the lower their risks of many different kinds of cancer. Other studies have shown that lycopene may also be heart-protective. The fact is that a Harvard study of more than 28,000 women, those with the highest blood lycopene levels were about half as likely to develop heart disease over five years as women with the lowest levels. The funny thing is that the researchers are singling out the lycopene. Which of course, seems to encourage people to say, “I don’t care for tomatoes or tomato products, I will just take a lycopene supplement.” My suggestion is that the scientists do not yet know if it is the lycopene by itself or the lycopene interacting with something else in the tomato. Even if you’re looking at how much lycopene is in the blood of the nurses that does not prove that it is the lycopene eaten in a tomato that is doing the job by itself. There could be any combination of lycopene with others of the hundreds of antioxidants in the tomato. Unless an experimental study with an isolated lycopene formulation was used, epidemiological studies involving tomatoes consumed normally will make it impossible to conclude that lycopene alone is responsible for the effects. This one phytonutrient would be indistinguishable from the other phytonutrients; all of them would be elevated in the nurses’ blood, in proportional ratios. Thus, it cannot be shown by such studies that lycopene alone is sufficient in delivering the healthy outcomes. The Harvard researchers will only say that it MAY be the lycopene, but the nutritionism mentality makes the leap from tomatoes to supplements without further evidence. Going from tomatoes to supplements discards the hundreds of other nutrients in a tomato, and pretends that the one is sufficient. It also pretends that the isolated nutrient acts the same as it does when taken in a whole tomato. Step one: Epidemiologists (researchers that study populations who eat more or less of certain foods) discover that those who eat lots of a certain food have less of a certain disease – in this example: Eat lots of tomatoes and tomato sauce and you will have less heart disease, high blood pressure, and cancer. Step two: The scientists discover that tomatoes are packed with lycopene and that it has antioxidant activity. Step three: Nutritionists say lycopene is responsible for the improved health profiles. Step four: The public begins taking lycopene supplements, instead of eating the tomatoes and tomato products. Or, another option: the public begins eating processed foods with added lycopene. 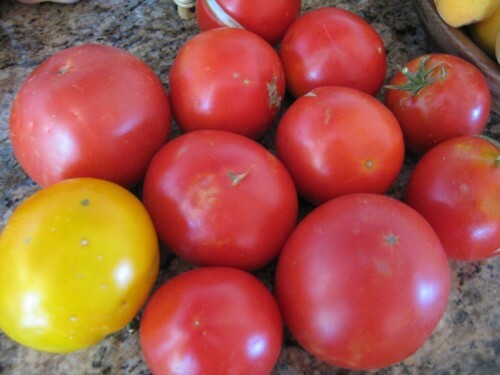 My suggestion is that there is a very real possibility that eating real tomatoes is REALLY much better for health than eating processed food with one single nutrient (lycopene) added to give it an advertised radiance – an imaginary glow of health. P.S. Besides tomatoes, lycopene is in watermelon, pink grapefruit, papaya, guava, red bell peppers, and green leafy vegetables (the green color masks the red lycopene). Back to the taste – I believe that the taste of vine-ripened tomatoes is a special treat of summer and autumn. For me, it is better than ice cream; I really enjoy the tang and sweetness that is combined within the fruit. I’m in a big time crunch right now, so I’m not developing a new recipe using tomatoes; but I will share how my tomatoes are being used. None of these methods take more than a minute and none mask the flavor of a fresh vine-ripened summer tomato. Chopped up and served with vegetable omelet. Chopped and served with our salads. Our imperfect tomatoes taste wonderful. More tomatoes on their way.